Bugaboo took three wobbly-yet-independent steps in a row today!!! 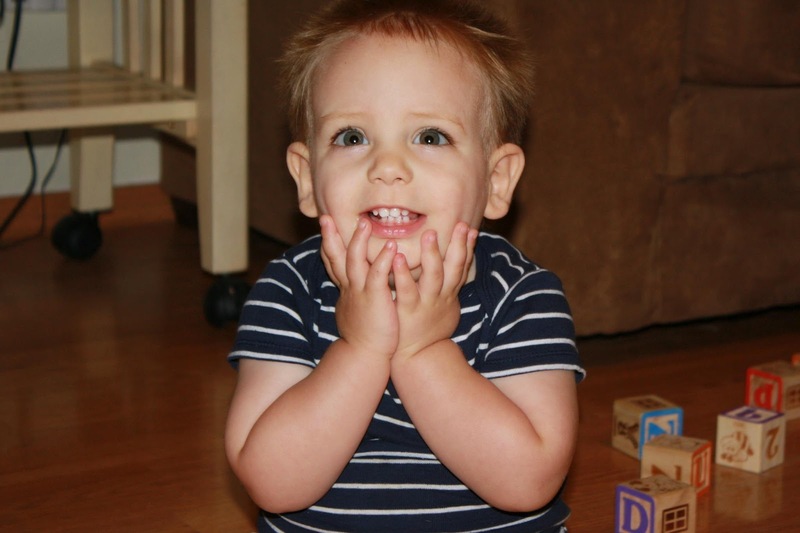 He is twenty-two months old, and the causes of his developmental delays are still unknown. We are still waiting for answers and milestones. But today some of our waiting (and praying and working) is paying off. My heart overflows with joy and thankfulness for this event. Then this afternoon, just following the celebrating, we received a discouraging piece of mail. The Hubs and I sat and wondered aloud, "What should we do, God?" We have choices, neither of which are ideal. We can give up or we can stay the course and wait. Honestly, there are days when we are weary of persevering. We feel like we have already waited for so many things. This evening I saw my toddler and thought about how hard he works. He recently got funky-looking devices put on his feet, but he didn't complain. He adjusted to his new footwear. He falls down, but he allows us to pick him. Then we make him try his skills again. Most of the other kids his age are passing him by, but he doesn't let that deter him. With help from his family and his therapists, he perseveres. From the outside it seems like a long wait for each milestone. But deep down I believe there is some divine purpose just waiting to be unveiled through my youngest son. I just haven't been shown what it is yet.. In this hard season of waiting, I will remind myself that I can't see the big picture - for my kids, for our careers, for this journey we are on. I want to give up praying, trying, waiting, but my youngest son reminded me today that this is not the time to give up. There is always hope. Just when I needed it most, I was given another spark of hope. I will cling to that as I wait. Because the waiting is hard, and without hope, all would be lost. side note: This post was written Wednesday evening. Yay! How wonderful! Rejoicing with you! Love these posts. So much to be learned in the waiting and even beyond. Thanks for sharing! Thanks! We are so excited. Every step is prayed in and worked for. Go, go Bugaboo! This is exciting! Praying for you as you continue to wait to hear His voice in other matters as well. Thanks for your prayers, Meg. I'm so glad we've become blog-friends.